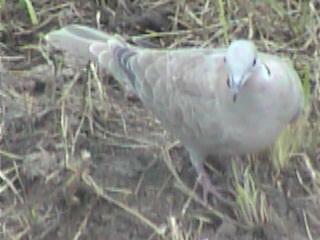 It apparently is something of a newcomer to Welder, since it isn’t listed at all in the checklist, but I’m pretty sure these shots that were taken this afternoon are of a Eurasian Collared-Dove. We have a lot of them in my neighborhood, and these shots show the distinguishing field marks (like the dark primaries) really well. There’s still some disagreement about what the earlier images showed (see the excellent summary of Texas birder comments posted by Rafa in the comments to the earlier item), but we now have a number of images that have achieved the standard for a consensus ID of Eastern Phoebe. Yay! Not the greatest shots in the world, but I think I’m leaning in the direction of the consensus ID. Congratulations on a new bird for the game! Update: On further reflection, and considering birderbf’s comment and some more-recent shots of what looks like the same bird, I think I’m now leaning the other way: That this is actually an Eastern Wood-Peewee, rather than an Eastern Phoebe. Shortly after the possible Eastern Phoebe photographed on the morning of 8/27, several shots were taken of what I’m pretty sure is a Kingbird. 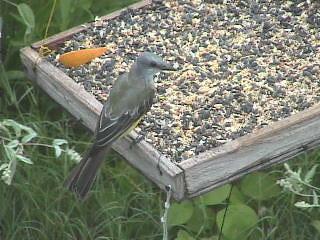 Unfortunately, I’m not sure which kingbird it is. 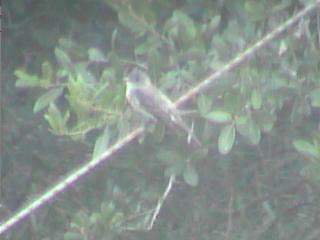 In the chat there was some discussion about whether this was a Tropical or a Couch’s Kingbird. I can’t say I’m confident either way, but apparently enough users were confident enough for it to be successfully ID’d as Couch’s. In any event, it’s a great shot of a really attractive bird. In the chat log (yay! I love the chat log! ), rafa speculated about it being an Empidonax or Cantopus flycatcher (presumably an Eastern Wood Peewee in the latter case). 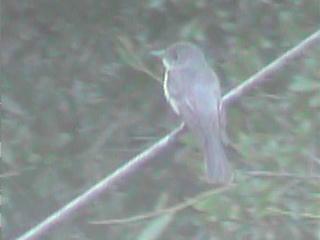 But idbirds responded that it looked more like an Eastern Phoebe, and I think I agree. I’m not seeing the wingbars I’d expect to see otherwise. Livening up a dull afternoon on August 16, a yellow bird appeared briefly on a wire in view of our Welder camera. What species? Tanager or oriole? Three people saw the bird, and two were fast enough with the camera button to give us a total of three pictures, all taken within eight seconds of each other. And then the bird was gone, and has not been seen since. Examination of the photos allowed us to eliminate tanager and focus on oriole – but which species? For the record here, the Welder Checklist lists both Orchard and Baltimore Oriole as Uncommon in summer, Orchard as Uncommon in fall, and Hooded, Audubon’s, and Bullocks as Accidental. 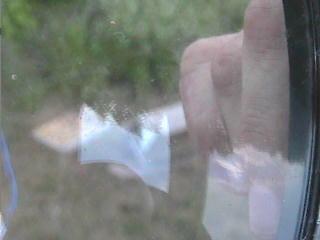 The pictures were taken at a distance, and the camera resolution is not high. The pictures show the back and side of the bird, but do not show the size and shape of the beak, or the colors of the breast and belly. 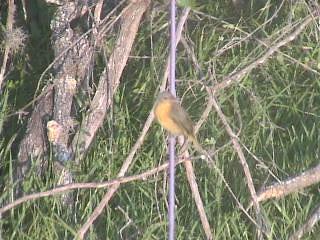 And despite it being the same bird, the colors on the back seem greenish yellow in one picture (37736 – kryptonkay), but orangish yellow in another (37740 – txbird). How big is the bird, what is the relative length of the tail, is the dark color of the tail significant, can the wing bar pattern tell us anything, why is the light area over the eye visible in one picture not visible in the others, how does this bird compare with other orioles seen at Welder, how does it compare with pictures we can find in field guides or on the web? Various of us consulted Sibley, National Geographic, the new Peterson, Birds of Texas, the Audubon Society Field Guide to North American Birds, and online All About Birds, and Birds of North America. We all rued the lack of photographs showing immature birds. Initial impressions suggested Orchard Oriole; but within a couple of hours Baltimore Oriole was added to the possibilities. 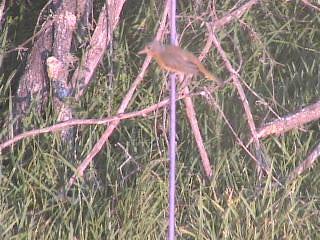 Late in the evening, Bullock’s Oriole was suggested. As it became clear that none of us could provide a definitive identification, rafa posted the pictures on two listserves: “birdforum” and “texbirds,” requesting comments. Several apparently authoritative responses were received – supporting either Orchard or Baltimore. One of the more intriguing came from someone who said Orchard, and added “The plant in front looks like croton, and I’m comparing the bird’s size to the leaves.” Loughman cropped the pictures, and enhanced both the resolution and size (below) to make it easier to examine the birds. It’s easier, but not enough for confident identification. The mystery oriole remains a mystery. Thanks to Ken Burton and Rita Colwell for their kind help with this identification. Lamont Brown, Katherine Miller and Keith Arnold from Texbirds list were so great to help us too with the Id. Thanks a lot!! jbm33206 and steveo from BirdForum also contributed comments. We are most appreciative. Loughman: Can you tell us whether your group has actually banded hummingbirds at Welder Wildlife Refuge? This afternoon there have been a large number of hummingbird visits to at least one of the feeders at Welder. 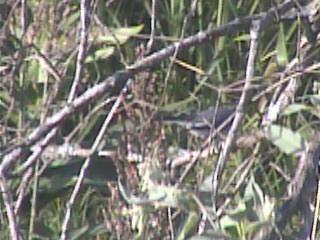 We have taken pictures of Buff-bellied, Black-chinned, and Ruby-throated hummers. 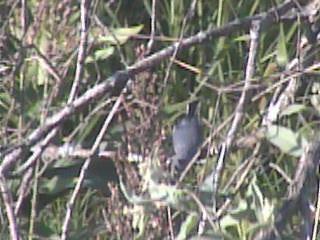 In the last hour, we have seen at least one Buff-bellied Hummingbird with a band on the right leg, and possibly one on the left as well. Is this likely to be one of yours? Your comments appreciated. 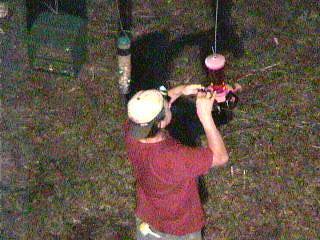 Rappole: We have not yet banded any hummingbirds at Welder. 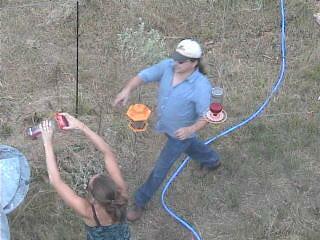 Loughman: I’m monitoring a remote camera at Welder Wildlife Refuge – I think it is not far from Victoria, TX. 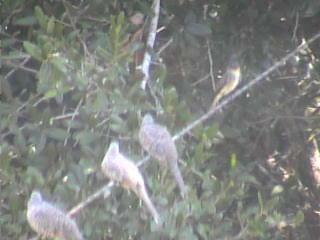 This afternoon we saw a banded Buff-bellied Hummingbird, and I immediately thought of you. Is this likely to be one of your birds? The protocol for the project at Welder (P.I. is John Rappole) says that they would band BCHU and BUFH, but we haven’t seen any evidence before today. If you are actually the one doing the banding there, I’d be glad to know anything you can tell me about the program – and I’d pass it on to the 30 or so others who are also monitoring the camera, none of whom are even close to Texas. Ortego: I have not banded hummingbirds on Welder Wildlife. However, I have banded hundreds of Buff-bellies near Victoria and Rockport. I have heard there was a MAPS banding program at Welder, but those do not normally band hummers. Buff-bellies are starting to leave their breeding grounds in search of areas of very high food concentrations to undergo body molt. The bird you observed might not be a resident of the area. Did you save a video clip of the banded bird and is there possibility of reading the band? Loughman: Thanks for your prompt response. 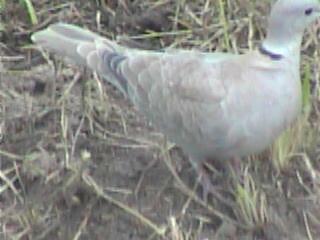 Unfortunately, the camera resolution is nowhere near good enough to read bands – even on much larger birds. I’m attaching a picture (no.35046) so you can see one of the best! It’s hard to confirm, but there may actually be a band on each leg. I’ve sent an inquiry to Dr. Rappole, but have not yet received a response. If you are interested in learning more about the project, you can read all about it at: http://cone.berkeley.edu. Ortego: I was not able to determine if there were two bands. There definitely appears to be one. I am not familiar with anybody banding on both legs. I have two adult males (which this bird is) which carry a 2nd band because the first band is so old that the numbers have faded away. One bird is a 12-year-old BUFH. He is due to arrive back at my banding station in September. Based on our pictures and our “live” observations, I believe this bird (am assuming it was one individual) is banded on both legs (see nos. 35075 and 35076). Mystery Bird: Summer Tanager? Clay-colored Robin? 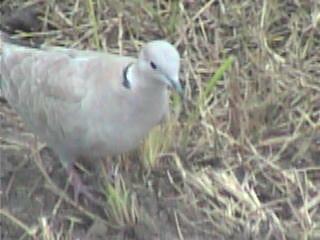 A number of users got shots of the following bird this morning. Forty-five minutes of chat discussion ensued (that I missed; we really need a chat log feature). 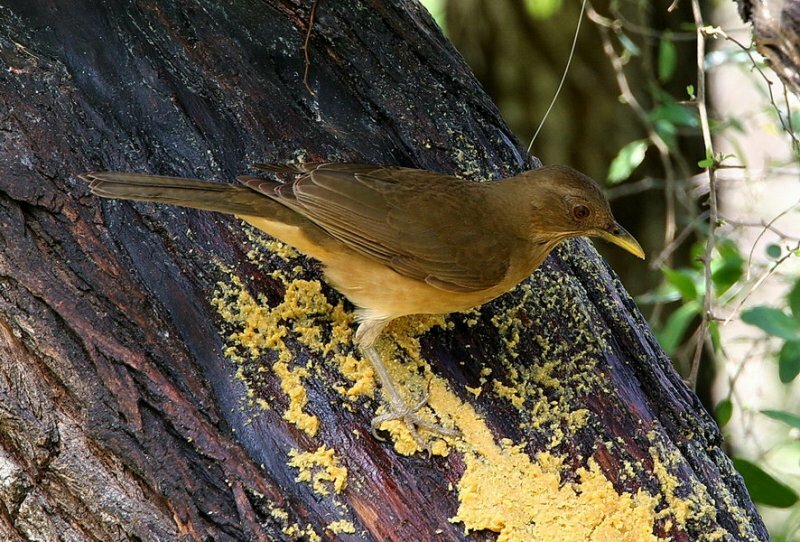 Folks seem to be leaning toward Summer Tanager (which is what I voted for, before hearing about the discussion), but at least one user is suggesting that we consider Clay-colored Robin. Check out the images. These were taken by txbird, loughman1, txbird, vanilla, and ohiobirder, respectively. There’s a grayish color to this bird’s head that is really interesting to me, and that I can’t really reconcile with Sibley’s illustration of either of the birds we’re considering. I think on balance I prefer Summer Tanager for this bird’s ID, which is a shame, since Clay-colored Robin would be a new bird for CONE. But it’s not on the Welder checklist, nor is it mentioned in the list of neotropical “species of interest” in the CONE Welder study. And really, looking at these images, it looks more like a Summer Tanager than either the web photo or the Sibley illustration of the Clay-colored Robin (a bird I’ve never seen in real life). But either way, it’s a really interesting series of shots. I wonder if the people watching the camera live got to see the bird doing its characteristic sideways tail-flicking. In any event, congratulations! You are currently browsing the The Networked Bird Observatory Blog blog archives for August, 2008.